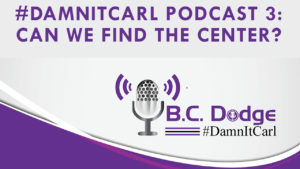 You are here: Home / #DamnitCarl / #DamnItCarl Podcast 3: Can We Find The Center? On this #DamnItCarl podcast B.C. Dodge asks – If there is a way to come back to center, or is the current social divisiveness our new way of life? If someone says something mean to you, and you respond in a childish manner of saying something meaner to them, and they make the choice of saying something meaner…when does it stop? It is this example that B.C. gives for this episode of his podcast, but only in the political realm. However, B.C.’s question is simply this…what will it take to stop all the hate speech and offensive activity – like calling 911 on African-Americans selling water, having a BBQ, or simply walking out of a store – and come back to center where we can all be nice to each other. A place where we respect one another, and we would work together for the betterment of society, or the betterment of a neighborhood. To come to a place where those that have extra not only can, but want to help those in need. There are 12 million kids in the United States alone that struggle with having enough food to eat; how much of your dinner did you put in the trash last night? While B.C. accepts that he is a bit of an idealist, he still would like to work with those around him to bring society back to a place where people were civil to one another, not because they had to be, but because it was the right thing to do.